Twitter is abuzz with news that Mitt Romney’s twitter account has added around 100K new followers this weekend. Followers, it seems, who are fake. Naturally, the inclination is to see it as an attempt to slowly ratchet up Mitt’s follower counts to close in on Obama’s, and there’s been many tweets of derision using the #MoreFakeMitt hashtag. However, it’s impossible to say who is behind this binge (unless you’re Twitter and can look into your log files). So it is very premature to blame the Romney campaign or someone connected to it. In fact, it could easily be an anti-Romney effort looking to discredit his campaign. The Romney campaign has denied buying followers. And I’m inclined to believe them. First, remember that you have no control over your followers. People choose to follow you or not on their own whim, and you are not involved. If 100 people choose to follow you tomorrow, you’ll get new followers. They don’t ask you, they don’t need your permission, and they don’t need to log into your account to do anything. Second, while the process of gaining followers is usually a person-at-a-time kind of thing, if you happen to have multiple Twitter accounts you can have them all follow the same person. Follower counts are counts of accounts, not counts of real live people. Third, since many people desire high follower counts, there is a not-very-underground market for people who are willing to pay for followers. The people providing these services have not just one account, or just a few accounts, but thousands upon thousands of accounts. All fake, to be sure, but each and every one of them counts as a follower. Finally, the people who provide these services care to get paid, they don’t care whose account they add followers to. I can pay someone to add followers to my account, or I can pay them to follow yours. They don’t really care. 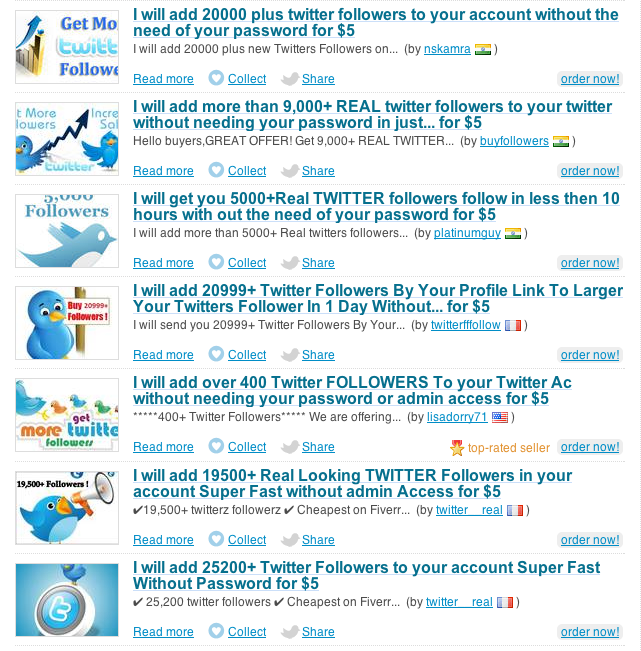 For $5 you can get around 25,000 followers. Mitt’s 100,000 followers could cost someone as little as $20. And that’s the key. Just about anyone can afford to buy Mitt 100,000 followers. For a lot of people, $20 is almost pocket change. And at $20, anyone who is motivated to buy followers for Mitt — regardless of being pro- or anti-Mitt — would find no impediment. This is the problem that we have now: it’s hard to know who’s doing this. Twitter can look up the IP addresses of the followers and determine where they came from, but the odds are the work was done in some distant (to us) country and the actual purchaser will never be known. So why am I inclined to believe the Romney’s campaign assertion that they’re not doing it? Because there’s no real advantage for them in doing it. First, Romney (at this moment) has about 800K followers. Obama has 17 million more. It’s a long, long way to add in 17 million more to Mitt if the goal is to show he’s on a par. Why bother? Second, Twitter will eventually remove all the fake followers. Even if the campaign were to crow about all its new followers, it would end up with egg on its face when they were removed. Who do I think did it? I think it’s just a random, unconnected person who thought this would be a good idea. Whether that person is pro-Romney or anti-Romney is impossible to guess. How did Twitter react to the Supreme Court Ruling on Obamacare? 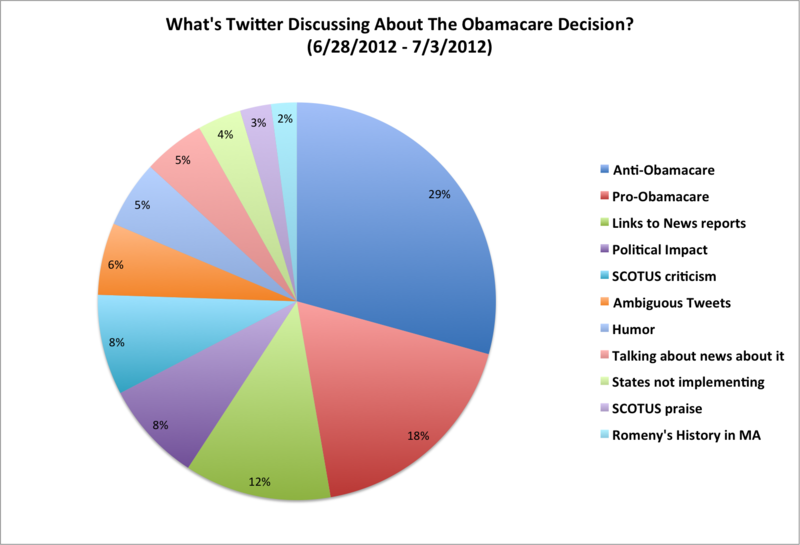 Does this mean that Twitter was almost 2 to 1 (29%:18%) against Obamacare? Not quite — a lot of the humor was directed at anti-ACA folks (mostly, it seems, about them moving to Canada in protest). Still, it’s clear that the anti-ACA tweeple have been more active. To do this analysis, I did a statistically valid sampling of over 500 tweets from the nearly 500K tweets that contained keywords related to the act and the supreme court ruling. I read each and every one of them (and sometimes followed the links in them to be certain of the intent). I then assigned them to one of the categories you see above (and discarded ones that were not on the topic). This sampling is designed to give each score a +/- 5% interval at 95% confidence. There are several sources of bias, of course. One is “volunteer bias”, which means that you cannot infer what the typical user of Twitter thinks, only what the typical tweet says. There is also a risk of an analysis bias, in that I’m reading the tweets and assigning them to the categories the best that I can. Sometimes, though, sarcasm and sincerity are hard to tell apart! Nothing] brings together the diverse communities on Twitter like a good ol’ fashion brawl. 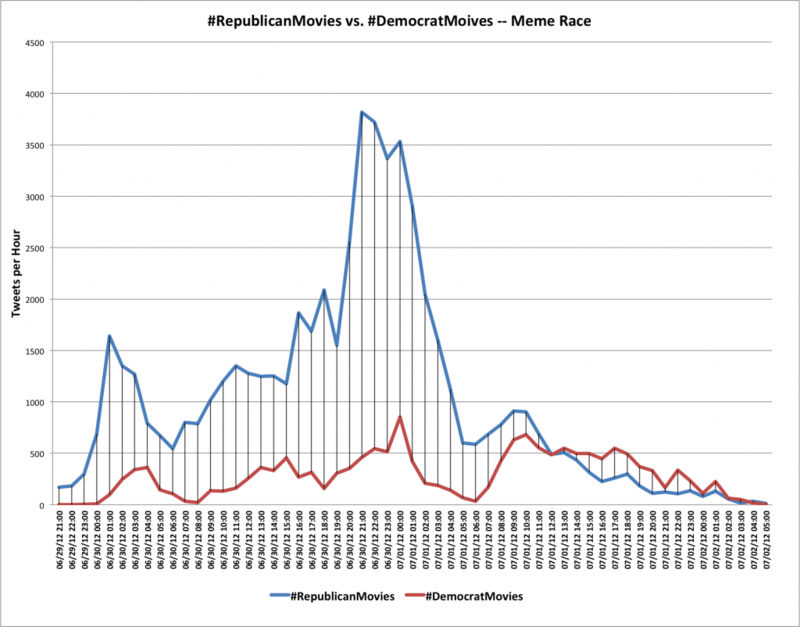 This weekend’s event was the battle of the #RepublicanMovies hashtag vs. the #DemocratMovies tag. In case you missed this event, the idea was to come up with variations of movie names that humorously slight the other party. So tweets with #RepublicanMovies are coming from democrats, and vice versa for #DemocratMovies. The last one is, in fact, the very first #RepublicanMovies tweet that I have found and appears to have started the genre!